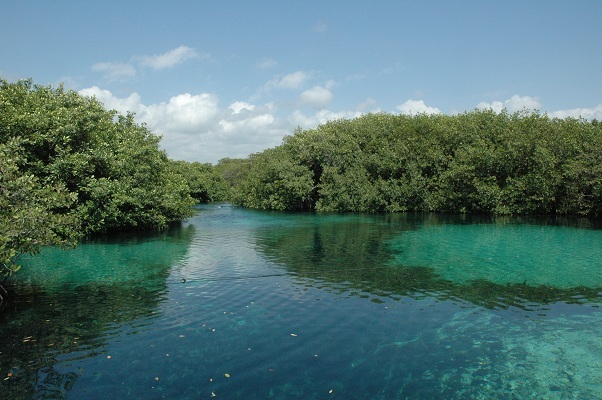 Cenote Azul | Ashlie's Cancun Blog and other stuff! Splashing around in Cenote Manati and Cenote Azul! It’s been a busy 2 weeks since my last post but I have suddenly found myself with a lot of free time coming my way for the next 3-4 weeks. Hubby and I have been very active lately, running in the mornings and afternoons and I have been going to Pilates classes with a couple of my girlfriends a couple of times a week, with the goal of losing some extra weight that I have dragged around for the last couple of years. Well, not anymore. This morning I fractured my toe (how stupid of me) and according to my doctor I will have to be off my feet as much as possible for 3-4 weeks-OH JOY!! So it looks like I will have loads of time to catch up with my blogging. 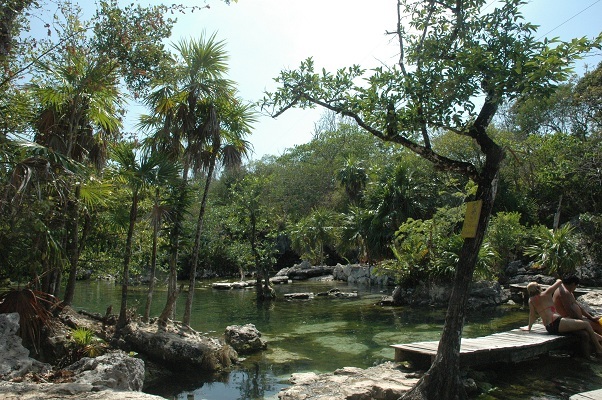 At the end of April we set off to explore a new cenote for us and an old familiar one in the Riviera Maya. Since it was my Mom’s last weekend in Cancun we wanted to take her on an adventure before she returned to Vancouver. 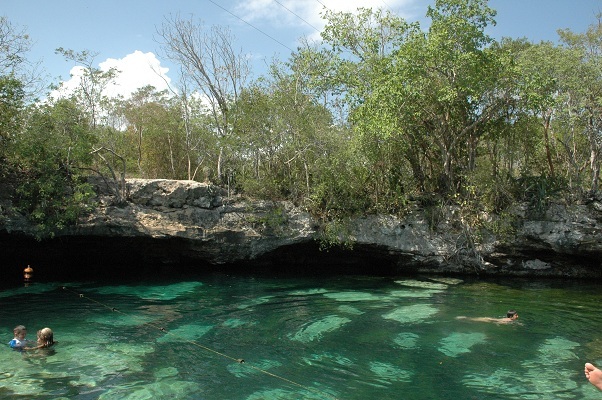 We hit the road early and made Cenote Manati our first stop of the day. When we arrived a tour bus had already beat us there but undeterred we parked and unloaded our snorkeling gear. My Mom decided to forgo the first cenote and instead she installed herself in a nice little restaurant on the beach and ordered a tall cool one. We were anxious to explore the cenote and we saw that they rented kayaks so my excitement grew as I thought that we were in for a great experience kayaking through the mangroves and waterways. We paid 50 pesos for each kayak and paddled off. Cenote Manati is located on the largest cave system of the world and is very picturesque to say the least; the crystal clear water gives off the illusion of various shades of green and is surrounded by lush vegetation.Cenote Manati received its name because in the past you may have come across a Manati but with increased tourism to the area it is now very unlikely that you will encounter one of these very shy creatures. As we were paddling through the waterways and manoeuvering through the mangroves I felt very peaceful and I was enjoying the physical exercise accompanied by the beautiful scenery. After about 10 minutes we hit a dead-end and try as we might we just couldn’t seem to find a way to keep going so we paddled back to ask the guide for directions. Much to our disappointment we were informed that you couldn’t go any further so we decided to kayak the same short route again. At 50 pesos a pop per kayak we felt somewhat mislead and we were determined to get some more use out of our kayaks. After we had paddled around some more we ditched the kayaks and armed with snorkel gear we delved into the depths of the cenote in search of underwater life. 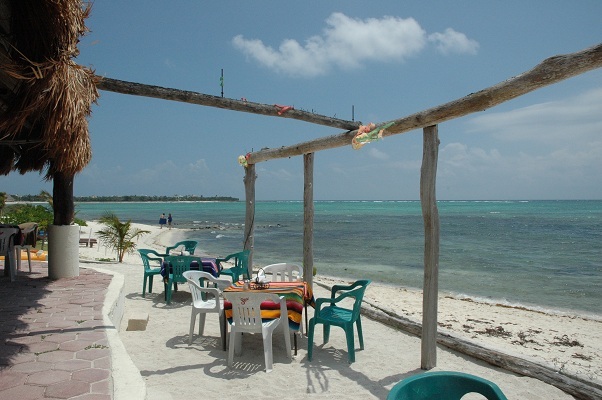 Once we felt that we had enough we joined my Mom for a drink and a snack and then we set off for Cenote Azul. After exiting the highway we found a nice shady spot under a tree and left our truck to make our way down to the cenote. It was a Saturday so understandably there were a lot of people cooling themselves off in the cool refreshing water and working on their tans. My Mom and I didn’t waste any time as we jumped into the water and swam around until we found a rock conveniently in the shade under a large overhanging tree. There we stayed until Cesar joined us and then I set off with hubby and snorkel gear to explore the cenote some more. As we swam around admiring the different species of fishes and underwater nooks and crannies I thought to myself what an amazing world exists below the surface. As the sun rose high in the sky we began to feel a rumble in our tummies so we packed up our stuff and bid adieu to Cenote Azul and headed to Playa for a well deserved lunch on the beach. It had been another great day in paradise and a wonderful way to spend my Mom’s last weekend in Cancun. Have you been to a cenote before? Which ones are your favourites?